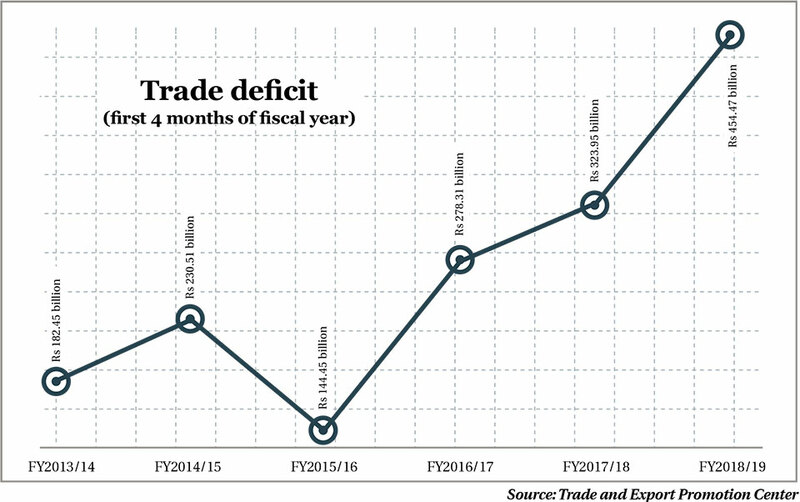 KATHMANDU, Nov 30: Trade deficit of the country increased by a whopping 40.3 percent to Rs 454.47 billion in the first four months of Fiscal Year 2018/19. The trade imbalance continued to worsen in the fourth month of the current fiscal year on accounts of skyrocketing imports and marginal recovery in exports. The deficit was Rs 323.95 billion in the first four months of FY2017/18. Provisional data for the period released by the Trade and Export Promotion Center under the Ministry of Commerce and Supplies on Thursday shows Nepal’s total imports increased by 38.1 percent to Rs 483.75 billion in the review period, while export grew by only 10.7 percent to Rs 29.28 billion. As of mid-November, the export to import ratio stands at 1:16.5. This means the country spent Rs 16.5 on imports for every rupee earned through exports. Such ratio was 1:13.2 in the same period of FY2017/18. 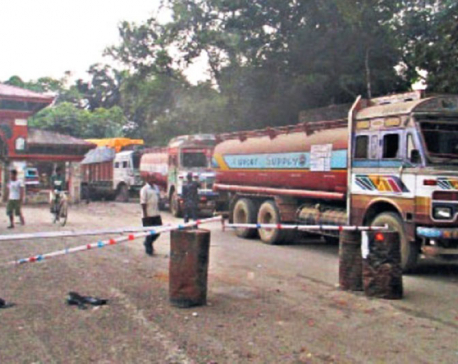 “Massive surge in import of petroleum products is the main contributor to the whopping import bill as well as the trade deficit,” Sarad Bickram Rana, executive director of TEPC, told Republica. The TEPC data shows that the country’s petroleum products rose by 68.2 percent to Rs 69.08 billion in the first four months of the current fiscal year. This commodity alone accounts for 14.3 percent of the country’s total imports. “When cars and motorbikes flood the country, particularly the urban areas, they also drive the demand for fuel. Since these both commodities are not something we produce, their imports are on a rising trend,” Rana added. Amid rising import of vehicles and petroleum products, Nepal Rastra Bank (NRB) has taken a corrective measure on automobiles financing. Earlier on November 7, the NRB announced a measure restricting banks and financial institutions (BFIs) to provide loans on the purchase of private cars. Under the new rule for private automobile financing, BFIs can now lend only 50 percent of the cost. Earlier, such limit was 65 percent. Economists and trade experts say that the ballooning trade imbalance figure should ring alarm bells for the government. Even, Rana cautions that the ballooning trade deficit poses risk to the country’s external sector stability. “Trade deficit itself may not be a bad thing. But, when it results into deficit of balance of payment (BoP) for a long time, it could pose problem,” he added. Import of iron and iron-based products surged by 10.4 percent to Rs 37.1 billion in the review period. Machineries and their parts was third on the list with total imports of Rs 37.1 billion, up by 7.7 percent, followed by vehicle and spare parts with total imports of Rs 37.09 billion. Similarly, import of aircraft and parts grew by a whopping 338 percent to Rs 17.54 billion. 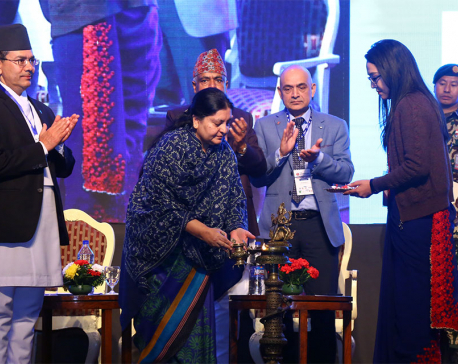 Many economists say that the growth in import of machinery and iron used for construction, and raw material for manufacturing industries, should be taken positively as they help in capital formation and create jobs. In exports, hand-knotted carpet topped the list in terms of earnings. The country exported Rs 2.76 billion worth of hand-knotted carpets in the review period. Yarn, readymade garment, iron and iron-based products were the other top exports of the country in the review period.